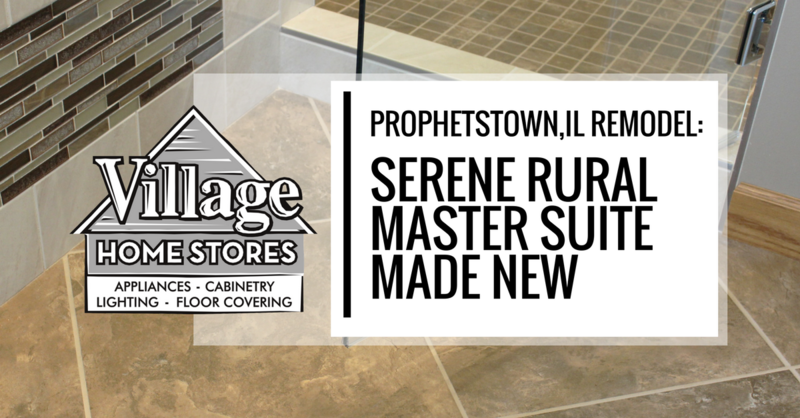 Join us as we tour this beautifully remodeled Master Suite in Prophetstown, IL. Rustic materials with a refined look, it looks amazing! A set of French doors with textured glass open up to reveal a new space including a custom tiled shower, large soaking tub, a private watercloset area, and a stunning vanity area. This Master Suite in the countryside is a rural retreat with earth tones and flowing organic lines in the mirrors and lighting selections. 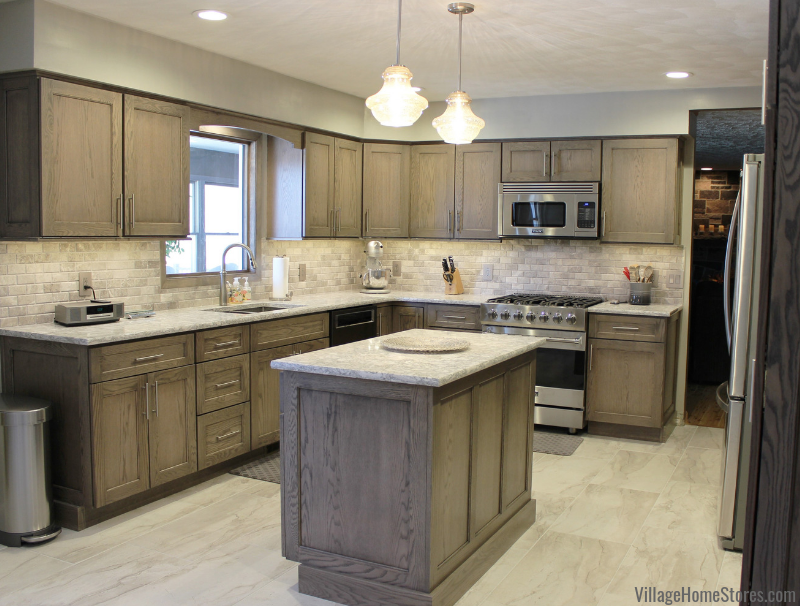 Neutral colors were selected as a backdrop to help showcase details like rustic knotty wood cabinets and some of the most interesting vanity sinks we have ever installed! 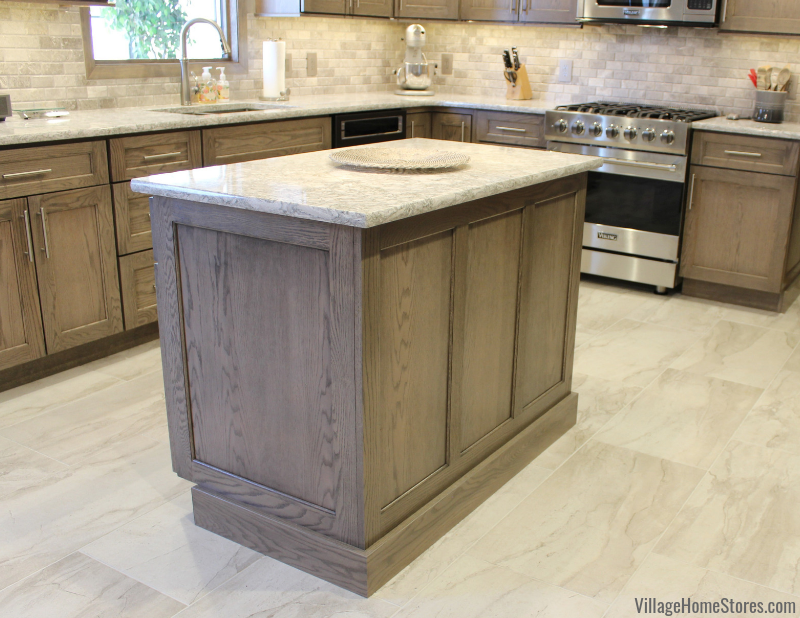 Two vessel sink areas are divided by a wall cabinet that meets the countertop in the center. A stack of drawers in brought out deeper to create a divided look and add interest to the shape of the vanity top. 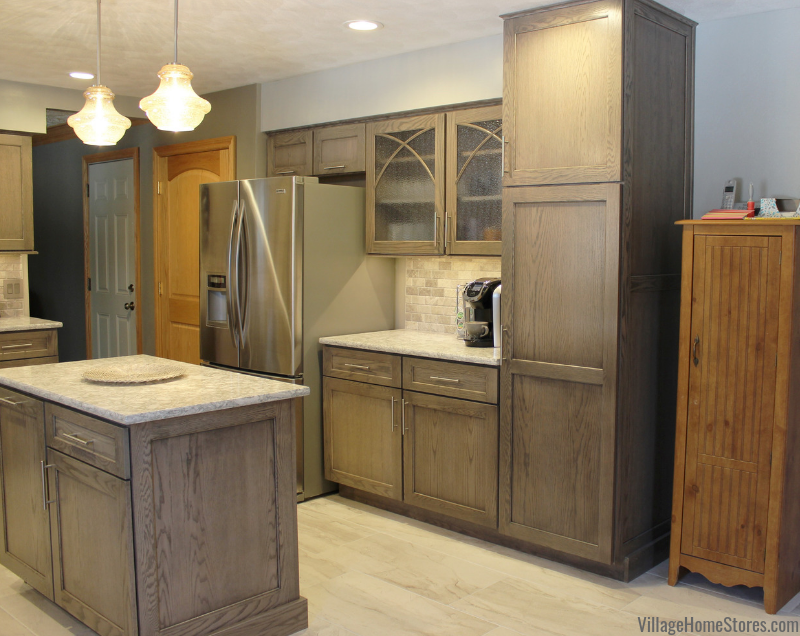 Koch Cabinetry in the “Vicksburg” doorstyle has been installed in a Rustic Beech wood species. This rustic wood is dressed up in a “Mocha” stain. 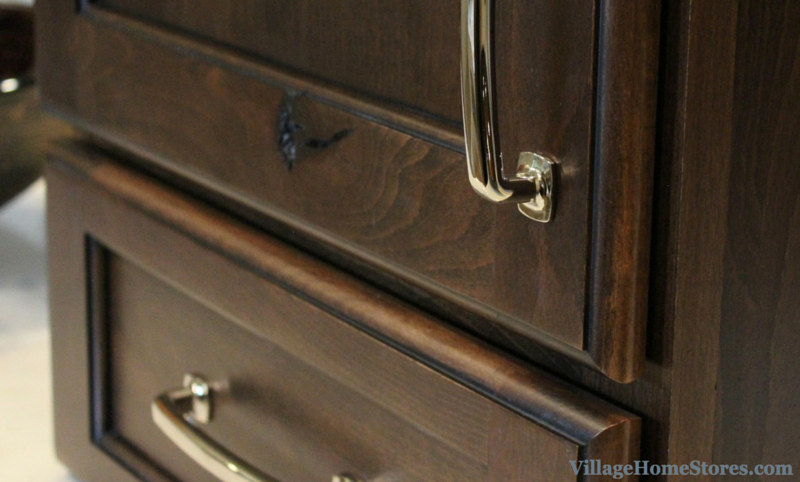 We love how the bright polished chrome hardware stands out on this rich “Mocha” finish. 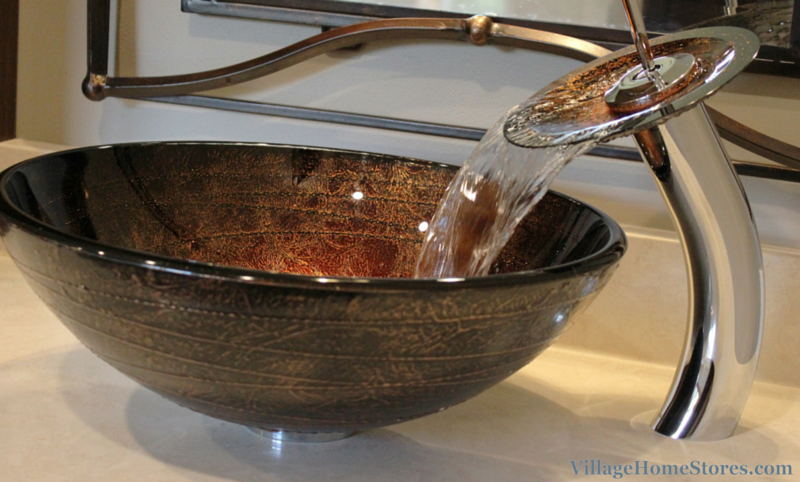 Speaking of standing out, how fun are the vessel sinks and faucets!?! These unique faucets seem to “sprout” out from the countertops. When turned on, the smooth glass design waterfalls down into the matching vessel sink. What a great look! These unique sinks rest on a beautiful piece of maintenance-free quartz. 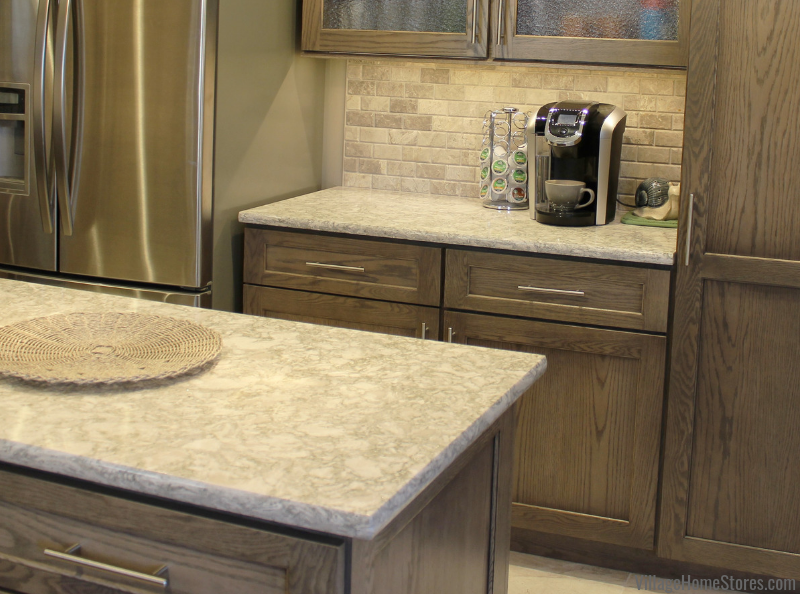 Quartz is a fantastic material to use in a bathroom because it is durable and non-porous. This means that spilling any products onto the top will not cause damage to it. There is no risk of scratching or scorching the tops either. 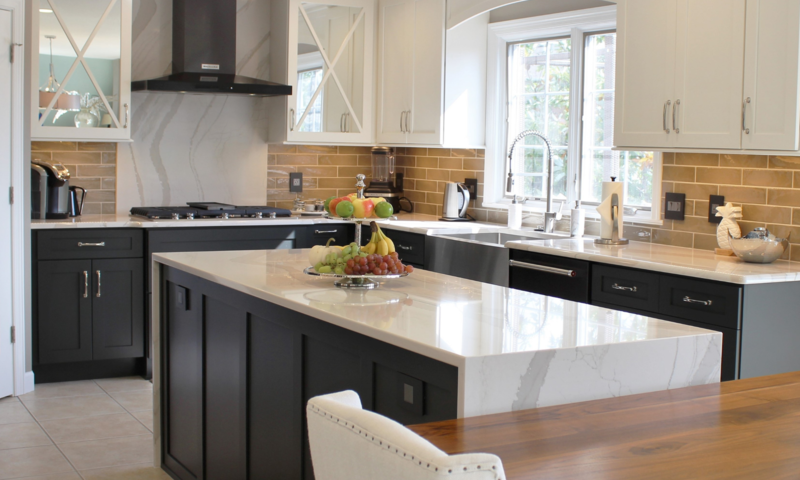 Cambria Quartz in the “Fairbourne” design is a great subtle choice as a base to showcase these unique sinks. 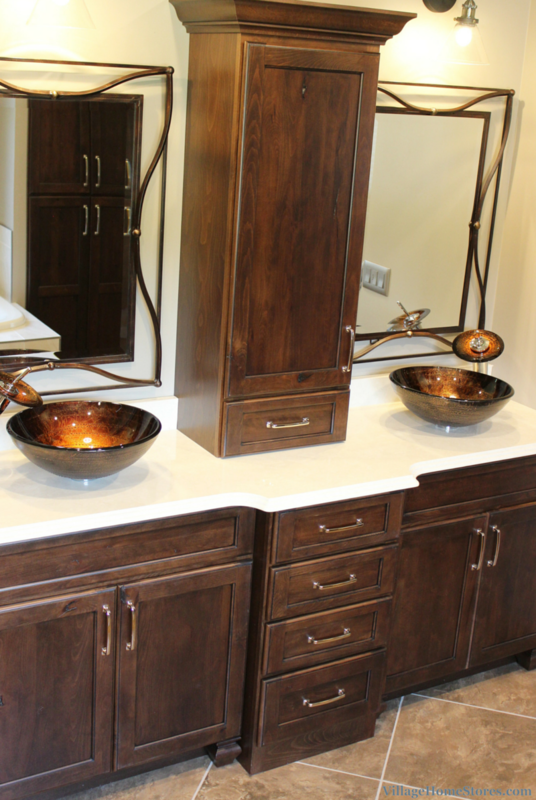 The look is beautiful and this customer selected a great edge profile to showcase the unique custom shape of their vanity design as well. 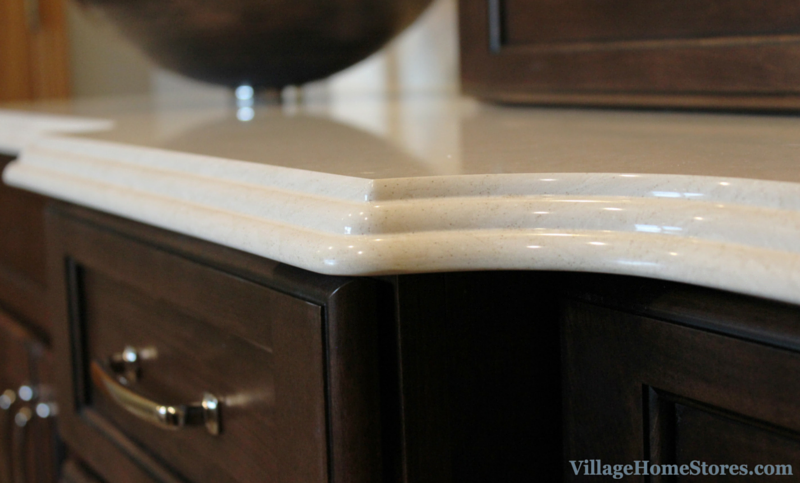 The “Waterfall” edge from Cambria catches the light and adds a great detail to the look. 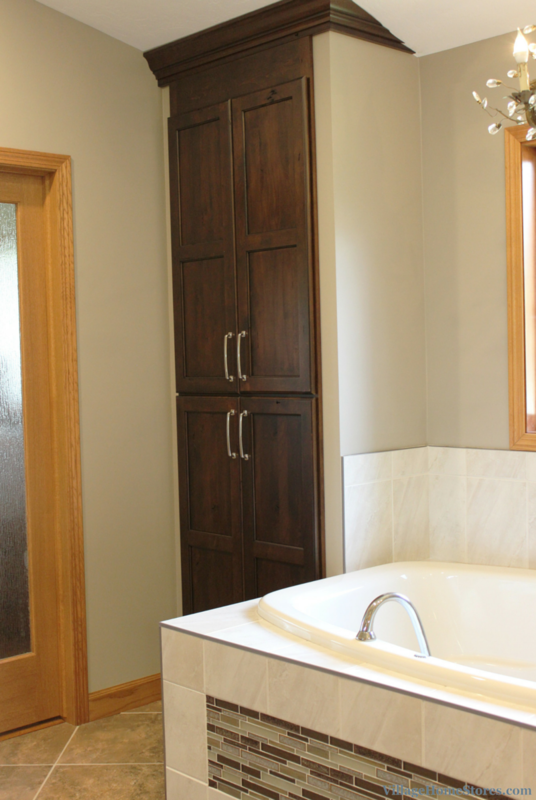 Tour this entire bathroom remodel on a recent episode of the Village Home Show. 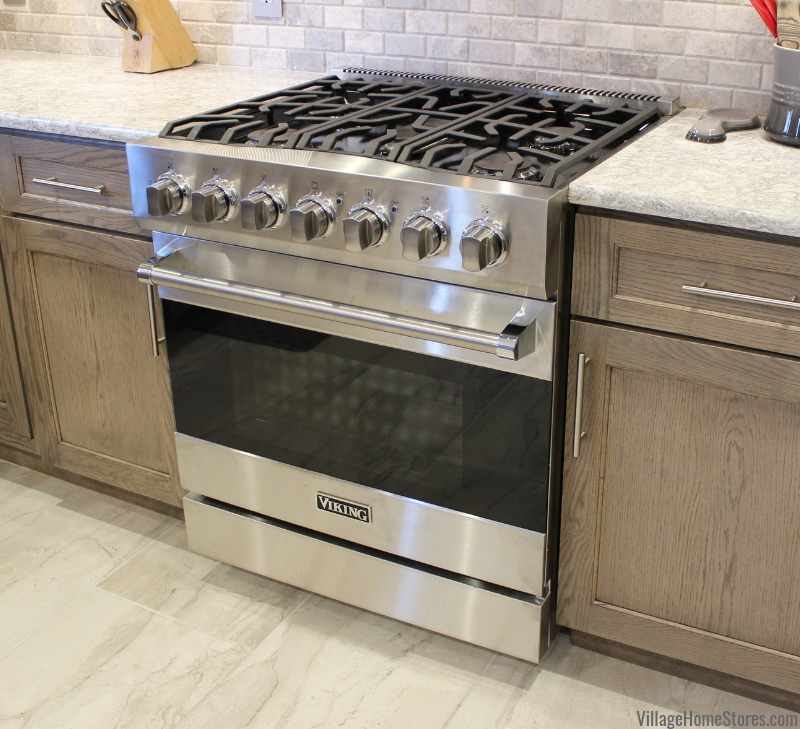 We walk you through every detail and finish. Press play in the thumbnail below to see this bathroom plus a hall bath and kitchen work that were all completed by our store. Other details include the addition of furniture style feet in the toespace of the sink cabinets. This helps give a more convincing furniture-style look and adds a formal feel to the rustic materials. 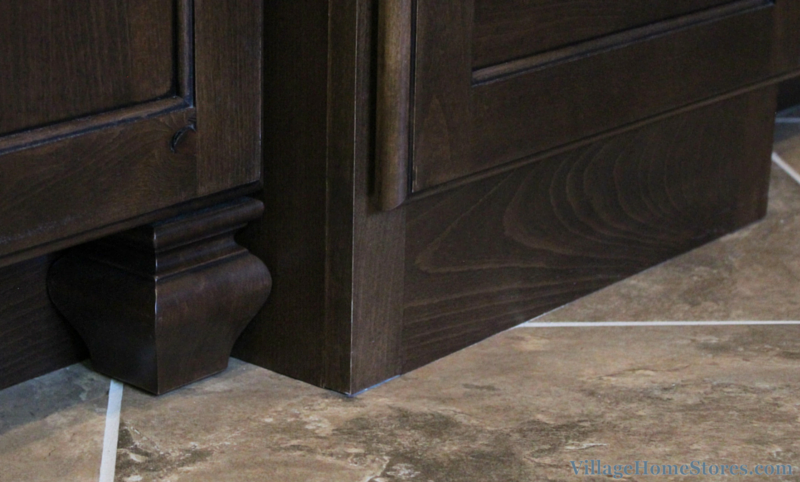 Adding feet may seem like a small detail, but it is these small details that work together to give a truly customized end result. In this Master Bathroom the shower has been separated from the tub area. Visible right upon entry into the Master Bath, this shower is eye-catching but not to be upstaged by the beautiful tiled tub area in front of it. 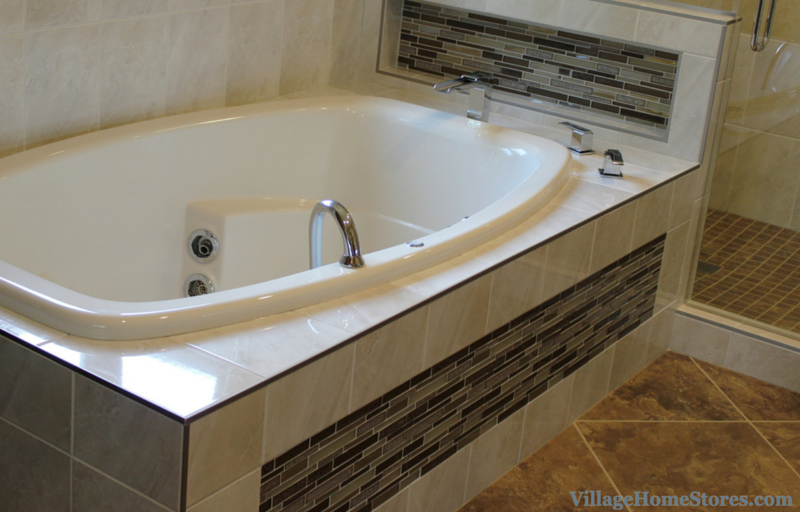 There is plenty of space for a large “drop-in” soaking tub. A tiled deck surrounds it and the accent tile from the shower is carried over into the front apron area of the tub plus the back of a custom tiled niche. Consider ever bit of space as a chance to love your finished design. 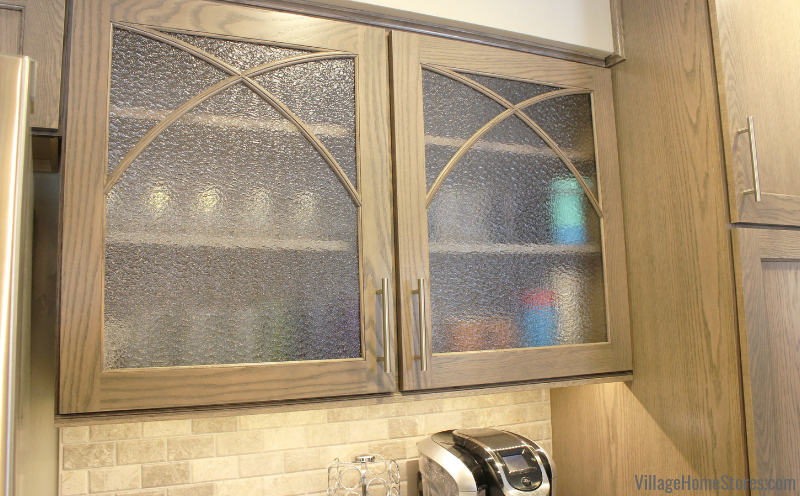 This wall niche is in the perfect location for soaps and toiletries to be stowed away. 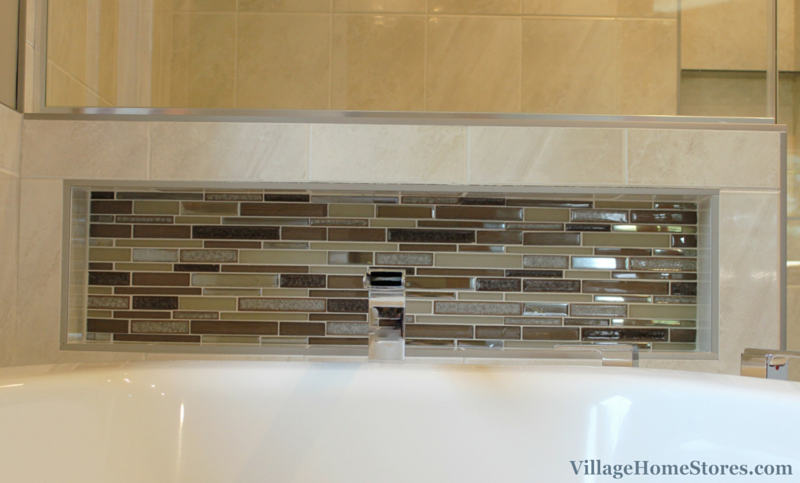 The niche also gave a great opportunity to repeat the accent mosaic tile. 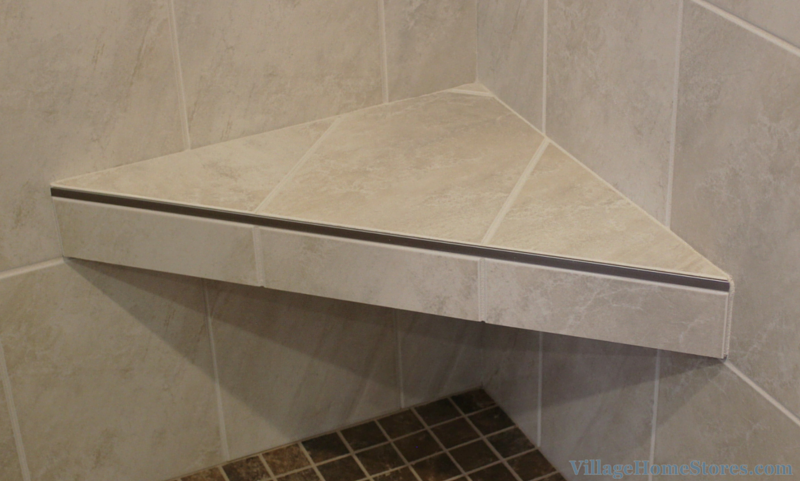 Speaking of customizing every corner of your design, why not add a bench in your shower. This tiled corner bench area might not seem like a large feature but it can be a place to rest a leg when shaving, or even set down toiletries within reach. So many of the bathrooms we remodel now include a custom tiled shower instead of a standard unit. Custom showers like this allow us to add the shower to whatever unique location you may have. Many times this means you may end up with a larger and more open shower look. 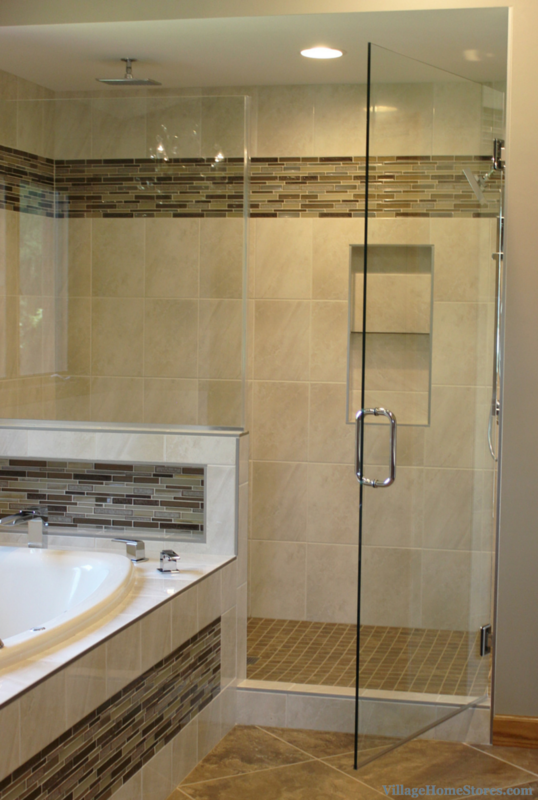 Tiled showers commonly receive a custom glass entry of some sort. 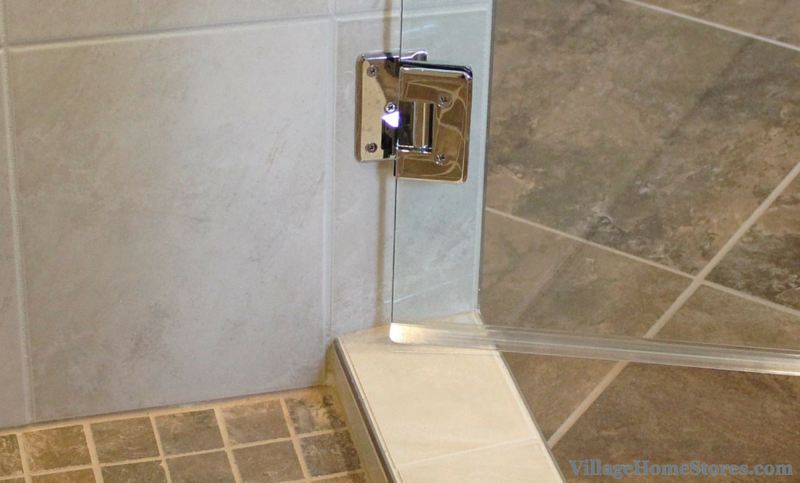 In this case, a short threshold of tile was installed and an glass door hinges out into the Bathroom. 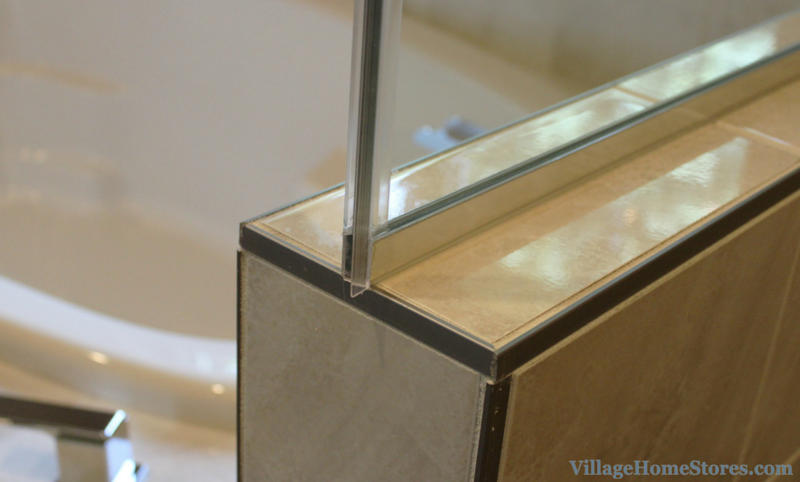 To help let in as much natural light as possible, a fixed pane of glass is installed from the kneewall behind the tub to meet the top of the custom door. The finished look is great and the end result is a more open and bright shower space. There is plenty of storage in this new Master Bath. Whatever will not fit in the vanity area can certainly find a home in this built-in linen cabinet. A tall cabinet front was ordered to match the vanity area and now this corner of the bath has a customized look. In the opposite corner of the bath from the linen cabinet is the stool. A private “water closet” space can be a wonderful layout choice when planning a large bathroom like this. 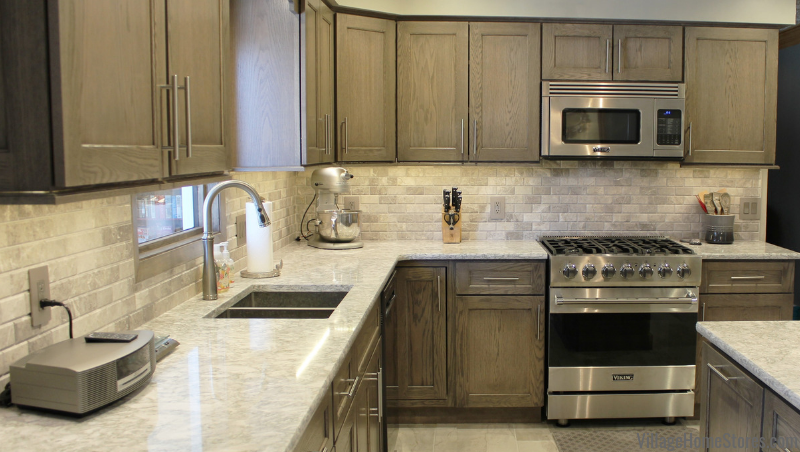 The light oak trim and doors are a great contrast to the dark Rustic Beech wood of the cabinetry. 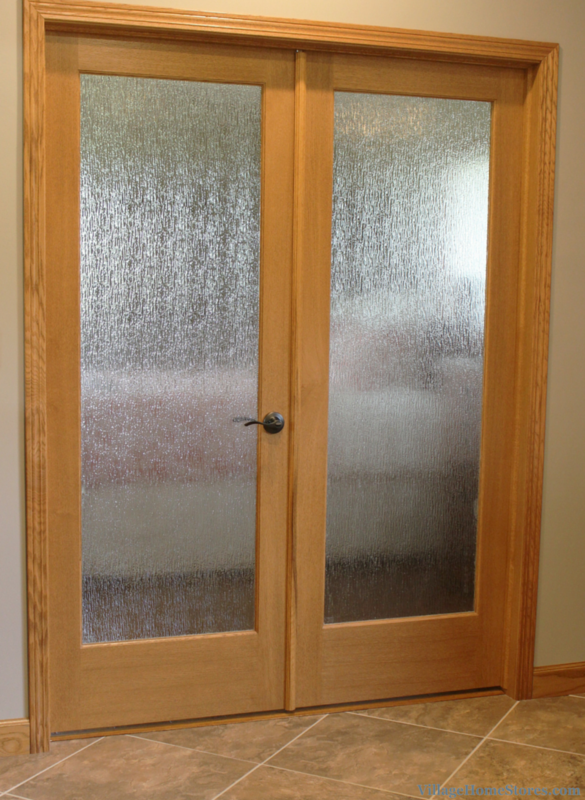 This same light wood finish is found on the set of French Doors that lead out from the Bath into the Master Bedroom. 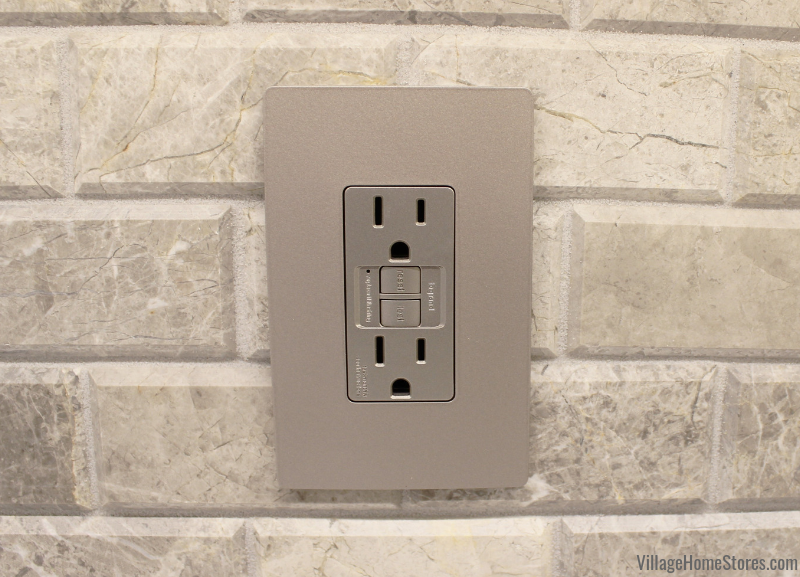 In place of a clear glass or even mullioned wood and glass doors, textured inserts were selected. 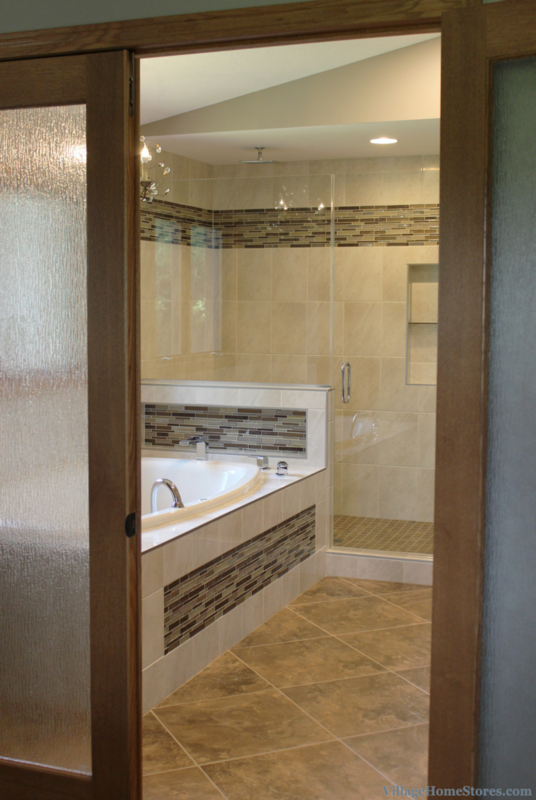 We love the way this allows light in and out of the Bathroom while also giving privacy with the heavy texture. 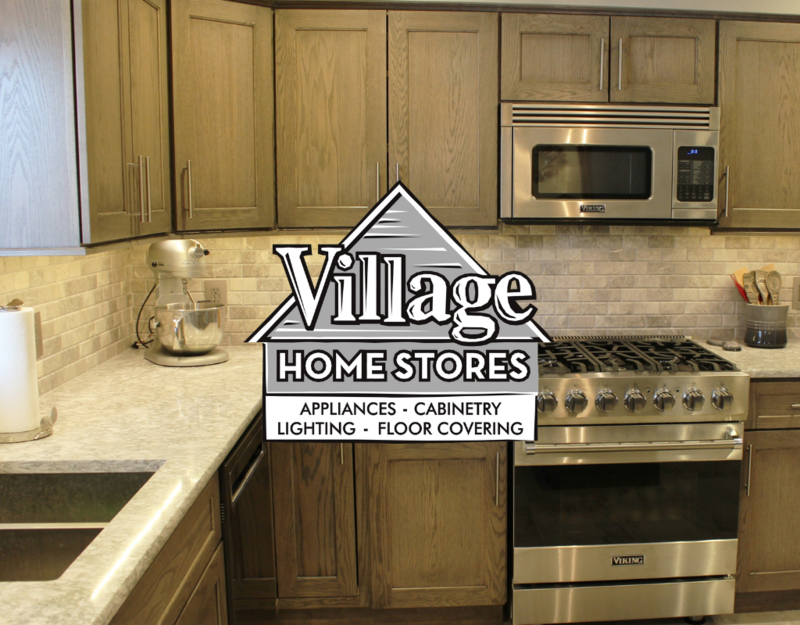 Village Home Stores has a wide selection of doors and millwork that we can provide during a project like this. 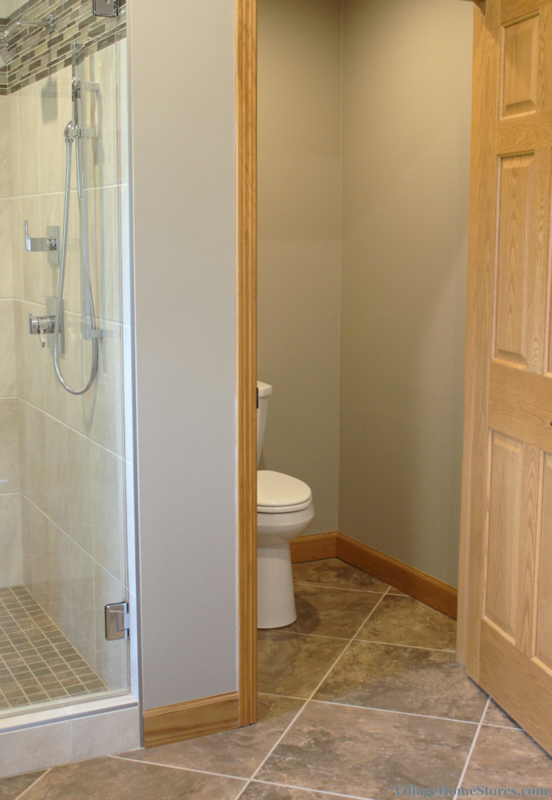 Do you have a bathroom project you would like us to work on with you? We would love to hear about it! 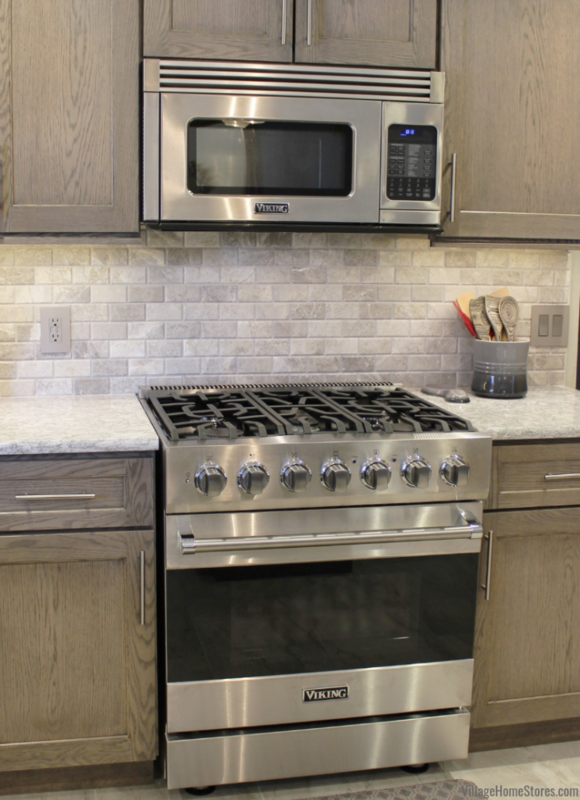 Building a new home, or choosing to remodel the one you are in, we can help make it a beautiful and functional space. 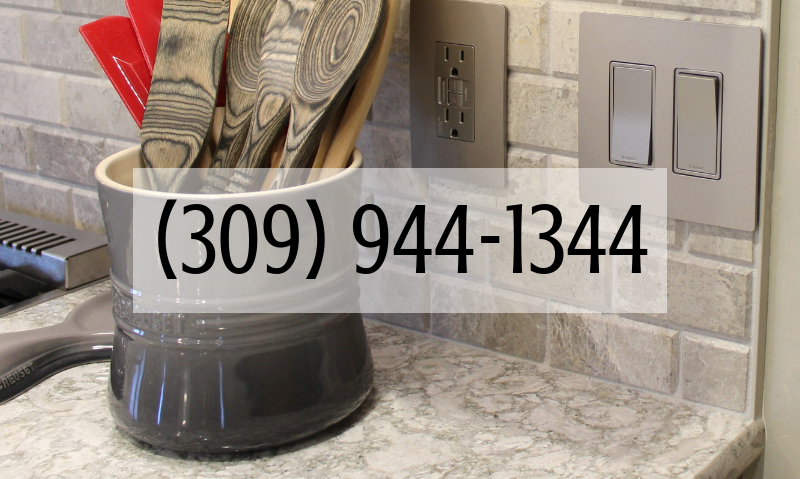 Be sure to check out the full album of photos from this entire remodel including another bathroom down the hall and a kitchen made over with mixed materials. 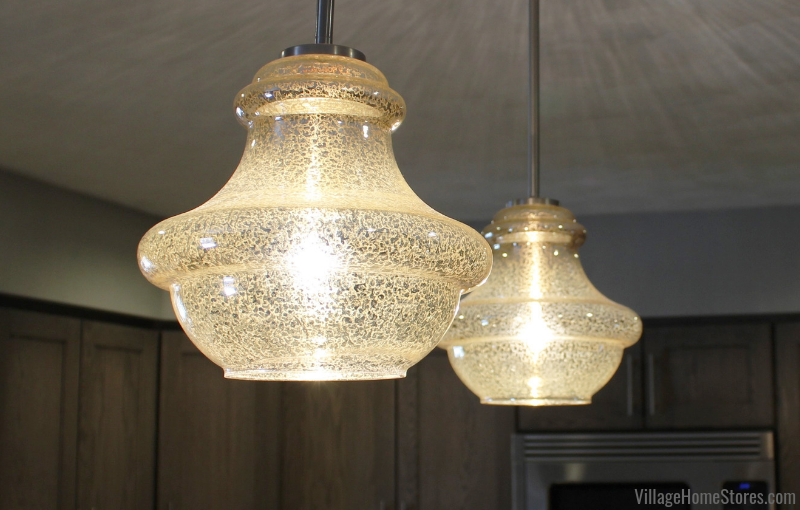 See the full album on our Houzz page here. Then give us a call to schedule an appointment to start the conversation about the space you want to work on. 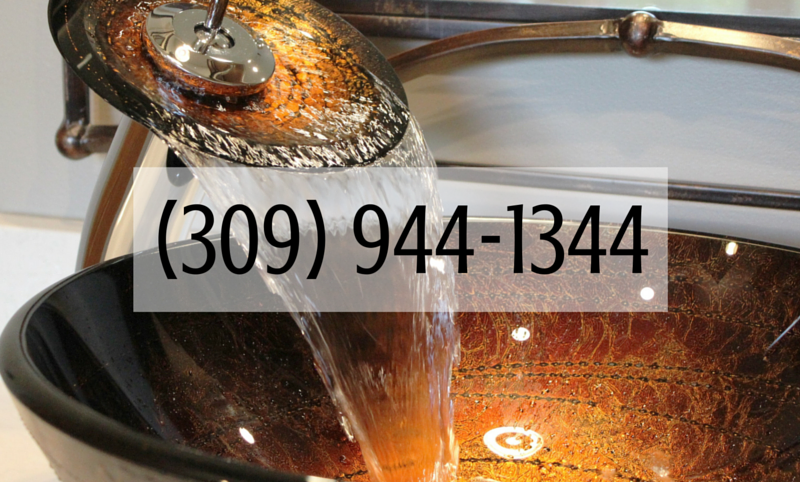 (309) 944-1344 or contact us online at this link and one of our designers will get in touch.